Perfect for cleansing and exfoliating, the crisp and refreshing scent of Fuji Green Tea™ Body Scrub helps to lift away dead skin cells and prepare skin for moisture. Availability: The Body Shop and selected Clicks stores. I am a big fan of all the body shop products I have used, some I got as gifts from friends and relatives, they are a bit pricey but worth every rand :-) I’ll be trying the Fuji Green Tea products this winter. I love The Body Shop so much! This Green Tea range isn’t my favorite because I feel that the smell of it could have been a bit stronger. However, it is very pleasant to bath with and is a treat for skin. It leaves my skin very soft! I’d love to try this, where can i get it? I’ve been hearing a lot about this product! 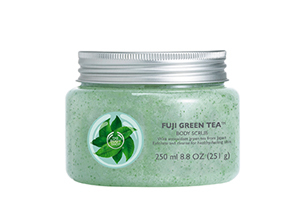 The Body Shop has done it again with their latest body scrub – Fuji Green Tea. A fan of green tea scented products, I was eager to try this out, as I know the ingredient is known for its antioxidant properties. I love the light, refreshing scent of this scrub. The beads are spread quite sparsely, making it a very gentle scrub. I used it with a loofah and loved it. The scent is so subtle that it doesn’t interfere with your body lotion or fragrance. Perfect for a morning pick-me-up!